Born: ? baptized 5 March 1765 at Madras (British Library N/2/1 f.310) and died 5 July 1793 aged 28 years, buried at Gillingham, Kent. Daughter of: Arthur Cuthbert (1734?-1788) and Sarah Cuthbert nee Hopkins (1744-1777). Amelia's natural father may have been Gen Richard Smith. 1. James Ramsay Cuthbert (1776-1821) who married Sophia (1777 -1857). 2. Sarah Cuthbert (born 1772 or 1776, died 4 Jan 1838). She married 1st Thomas Brooke Esq (died 1809) and 2nd Otto Vilhelm Klinkowstr鰉. 3. Charles Cuthbert (born around 1771 as he died 18 November 1777 aged 6). Amelia married: 27th October 1785, William Marsh, (1755-1846) son of George Marsh (1722-1800) and Ann Marsh (nee Long, 1720-1784). 1. Arthur Cuthbert Marsh (1786-1849) who married Anne Caldwell (Marsh-Caldwell, 1791-1874) daughter of James Caldwell (1759-1838) and Elizabeth Caldwell (nee Stamford) (1754-1831). 2. Amelia Marsh (21 December 1788 - 26 August 1861). 3. George Marsh (1790 - 30 July 1868). 4. Madame Anne Gabiou nee Marsh (1792 - 1870) who married Monsieur Gabiou de Chanceaux. 5. Sarah Marsh (died 14 August 1793 aged 5 months). Amelia's mother died in 1777 when Amelia was only about 12 years. Amelia's father was overseas during much of her childhood but there is nothing to indicate that Amelia did not have anything other than a good childhood living in their large family home of Woodcote in Surrey. In 1785 Amelia made what appears to have been an excellent marrige to William Marsh who was a Banker and a Naval Agent. Some letters to Amelia exist from her father around this time and her marriage is noted in her father in law's diary (George Marsh ). 27th October 1785. My dear son William was married this day Thursday to Miss Amelia Cuthbert at St. Mary L'bone Chapel. Present: her father, sister, her uncles Alexander Cuthbert and Colonel Hopkins, Miss Dove and myself. Her father gave her �,000 of which �,000 he desired might be settled upon her, but my son desired to make it �,000 which he settled upon her accordingly. At this time his fortune and income were equal to hers, so that if riches will produce happiness they have a very large share to begin the world with, and the greatest prospect of it. We returned to Mr Cuthbert's house in Berner Street where we met Mrs Hopkins Mr Cuthbert's mother-in-law, my son George, Mr John Marsh and his wife, and proceeded from thence to Mr Cuthbert's house called Woodcott Park near Epsom and spent several day together. Amelia's father died only a few years later in 1788 and Amelia died in 1793, at the young age of 28, leaving three surviving children. 5th July 1793. My son's wife Amelia Marsh died in her way home from Bristol hot wells, who left him five children, the youngest of which named Sarah also died the __August following and they were both buried in my vault at Gillingham, the child was buried the 5th Sept and Mrs Marsh the 12th July. 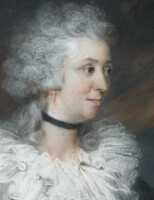 'Amelia, Wife of William Marsh Esq. (the surviving son of the above mentioned George and and Anne Marsh) Eldest Daughter of Arthur Cuthbert Esq of Woodcote Park, Surrey. Died (unlamented only where unknown) the 5th of July 1793, Aged 28 years leaving five children, namely Arthur Cuthbert, Amelia, George , Anne and Sarah, the later of whom died the 14th August 1793. Aged 5 months and is Buried in this Church with her Mother'. Amelia's portrait exists with the inscription 'Amelia wife of William Marsh of Willie House, Hampshire daughter of Arthur Cuthbert of Woodcote, Epsom', painted by John Russell RA. A small miniature of the same portrait also exists. Another portrait by Lemuel Francis Abbott is known to have existed but its whereabouts are not known.